Have you checked out Henning Ludvigsen art, "The Asend."??? Check him out! You won't be disappointed! By the way I always start my canvas's at 650x650 , but you are free to open a canvas bigger or smaller, and scale the elements to the size you want. But if you are like me, keep reading on, thanks. Open frame kk_frame1, copy and paste in the center of your new canvas, now for these nezt steps simply remember you are arranging the elements under and around the frame, duplicate as much as you need, follow my signature for example. Open- kk_rope2, re-size it to 80%. Open- kkpaper8, re-size to 50%, <---make sure you paste this under your frame! Open- kk_plant2, re-size it to 80%, <-make sure to go to.... Image-> and click on "Rotate Right"
Open- kk_pinecone, re-size to 10% <-- duplicate a few cones and place them around the grass. Now that you have re-sized these elements according to my sizes, added the drop shadows to all. Except for the grass. 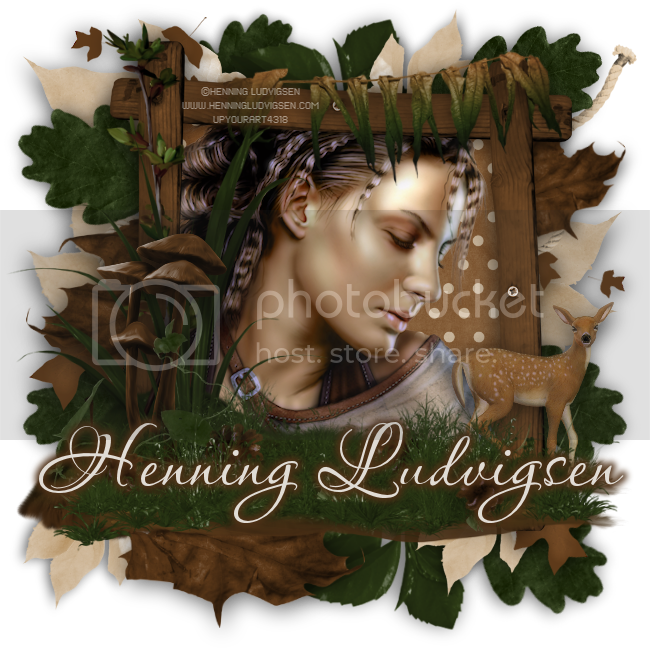 Now off to your tube, first find a nice close up tube, I choosed Henning Ludvigsen artwork. His close up artwork, "The Asend," is just perfect for Karra's Outdoor Odyssey kit. Place your close up tube under your frame. Apply a drop shadow, and your almost done ;).